Coverage of Grand Opening demonstrations and controversy. Transcript located in print media file for the year 1993. 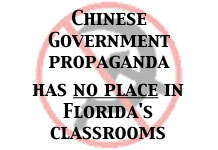 Coverage of Pinellas County School Board resolution to stop school sponsored field trips to Florida Splendid China. Transcript located in print media file for the year 1995. Transcript located in print media file for the year 1996. Interview with Inner Mongolians about Florida Splendid China. Interview with Tibetans about Florida Splendid China. Coverage of demonstration to commemorate the third anniversary of the Grand opening of Florida Splendid China. Coverage of demonstration to commemorate the 48th anniversary of the takeover of East Turkestan. Professor Norbu (elder brother of His Holiness the Dalai Lama) in attendance.